Have you ever put together a resume you felt was pretty impressive but never got a response from the potential employer? Or worse, you received an electronic rejection letter? Well it might just be that the response you received was from a machine rather than a person. Artificial intelligence (AI) has permeated every aspect of modern life and the recruiting and human resources industries are no exception. Today, AI is being employed in the recruiting process to hire more qualified candidates faster than ever before. According to a survey of nearly 800 talent acquisition professionals conducted by global organizational consulting firm Korn Ferry, almost half (48 percent) of recruiting professionals welcome AI as a tool. The survey also showed more than 60 percent of respondents said AI has changed the way recruiting is done in their organization and another 69 percent said using AI has been a game-changer when it comes to recruiting higher-quality candidates. Arran Stewart, co-founder and chief visionary officer (CVO) of Job.com, said AI has been used for recruiting for more than 20 years and the technology just keeps getting better—though it’s not what people think it is. The first type of AI in recruiting began when people would read resumes from online, according to Stewart, who said databases then appeared. Artificial intelligence is developing at breakneck speeds in all industries including talent acquisition. Most of us know the applicant tracking systems (ATS) nearly all major companies use when searching for talent but we don’t think of it as AI. 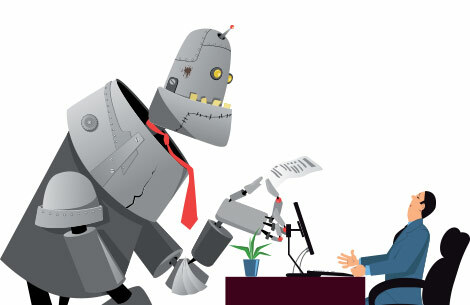 Another form of AI is internet bots, which is software that runs automated tasks over the internet such as processing applications, resumes, and cover letters. Modern AI has even been gifted with the ability to “learn,” according to Stewart. Stewart said today’s AI is programmed to use the natural language process to “learn” as it works so that it becomes better at its job with every applicant it processes. As the AI program processes resumes and applications, it understands the context of the words being used and the more words it knows, the more sophisticated the match is, according to Stewart, who calls that process machine learning (ML). When you are job searching and applying for jobs, AI looks for certain keywords and patterns, according to Stewart. When you write your resume, AI is programmed to search for specific key terms such as those posted in the job description. One of the best ways to get past AI and ensure your resume reaches a human is to include key terms and phrases from the job description in your previous roles, personal attributes, and skill sets. AI also identifies patterns in applications and resumes. For example, it will key in on dates to determine your staying power as a candidate. That’s why having months and years for start and stop dates in previous roles is imperative. As creepy as it sounds, AI is tracking you, but it can help in your job search. When you are job searching, you may feel you are being “watched” when ads or emails for job openings seem to follow you online. It’s because AI is notating the pattern of positions you are applying for online and reacts to the pattern, sending other openings you may wish to apply for based on your previous job-search history. Stewart said the war for talent has never been as prominent as it is now. This stimulates job-hopping and movement as people chase their dream of promotions and money. Artificial intelligence has become more prominent because the staffing industry and recruiting are growing. As Stewart points out, the economy is growing and there is a great deal of turnover. He said in companies such as Amazon and Google the average IT person is there just one year before moving on. With the vast options for salary capabilities, stock options, and other huge incentives to lure talent, 21st century businesses will continue to compete for talent and something has to give. Stewart said that “give” is technology. Since AI uses the natural language process for learning, Stewart said one of the best ways to make your resume work with AI is to be as descriptive as possible. He said the machines are smart enough to see through slang, typos, synonyms, and institutions. You will also need to be very articulate with your dates as they are scored in a resume. The system will read a resume and see January 2001 to June 2009. It will calculate the days spent with that employer and combine that with the keywords used, then weight it, according to Stewart. Another advantage is knowing that everything of more than five years is consistently classed as senior-level experience where AI is concerned. That means the more years you have spent in one role or with one employer helps on your resume. If you have strong content with relevant information, it will get passed to a human by AI, according to Stewart. He said you need to create a resume that is reflective of you. If you are looking to switch careers, Stewart said this may be more difficult as AI has not yet been able to compensate for career changes. He said that sort of job seeking is where you need to network and get your foot in the door in a different way. “If the technology can’t do it, then good old-fashioned networking is the way,” said Stewart. Use key terms relevant to the position you are seeking. Find them in the job description. Use relevant experience for the job you want. Use accurate dates for previous employment. Use consistent language related to your skills and attributes. Avoid throwing all adjectives in at once by sticking with three significant skills or attributes. In your personal statement, highlight key skills and experience. If you have done everything, use what you are best at. It’s better to be a specialist than a jack-of-all-trades.